Reviewed by Mirass Jalil. Viewed at Santa Barbara International Film Festival. First of all, David O. Russell’s “Silver Linings Playbook” and “The Fighter” is two masterpieces that deserves as much credit as possible. However, “American Hustle” in my eyes is definitely not a masterpiece nor is it a film that deserves an Oscars nomination. So when I got to Arlington Theatre during the Santa Barbara International Film Festival, to see David O.Russell accept the Outstanding Director Award, my expectations was low. Nevertheless, I immediately found him interesting and kind of forgot “American Hustle” for a while and just listened to his story and thoughts. Both David O. Russell’s mother and father was interested in literature so he grew up in a household filled with books and novels. No wonder he inherited his interest in write and teach english from both his parents. He never attended film-school, which means that everything he knows about film has he learned on the job or by himself. He said that he usually memorize a 20 minute section from a few films, analyze that sections. He said that this method was the most rewarding one. 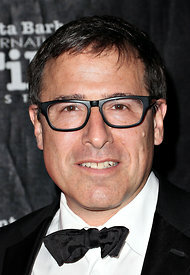 David O. Russell is now one of the biggest names in the business with his 25 Oscars nominees. He is known for his handheld camera movements as well as his chaotic scenery. After this interview I respect him and his vision even more. His sense of humor and the way he took over the interview just shows a man that is comfortable as a leading role and a man that knows how to take control. A quote he said that explains exactly how much work this man puts into his work; “I make every move and scene as it could be my last.” Amazing director and writer with amazing vision, with an exception for “American Hustle” of course. It’s a two hour shady journey with fat suites, perms, wigs and awful acting from the most parts . The whole film is a hustle where they have convinced all of Hollywood to proclaim it a masterpiece with its star cast. American Hustle is under directed, it’s over acted and it’s paste like a snail. I think David O. Russell has a very unique way to work and communicate. I haven´t seen American Hustle yet so I can´t tell my opinion about this particular movie but for sure it was a amusing interview. I’ve seen and heard a lot about David O Russell’s attitude but on this night he was making jokes and took over the entire night. But I do think this guy is very talented man that makes great films. He just has his own way of doing this that most people can’t/don’t/won’t understand. American Hustle is a great film that will probably win some oscars next month and be watched for for years to come.